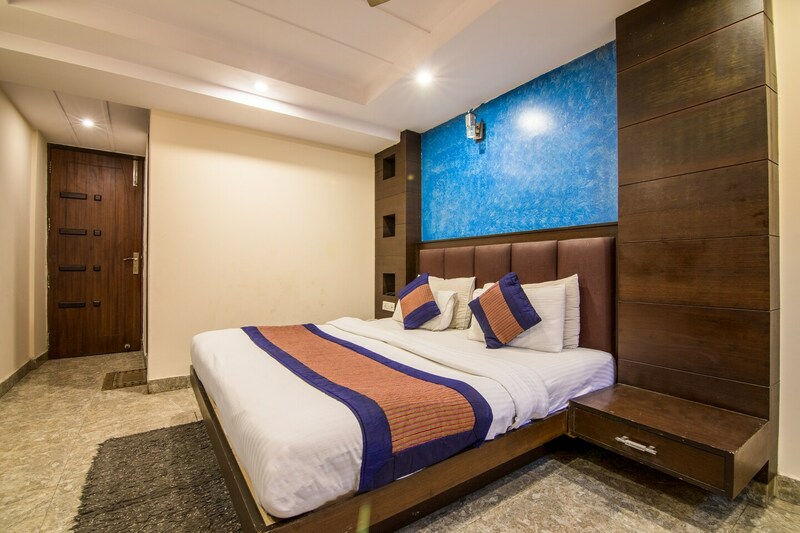 The Hotel Dada Cottage is a modern and comfy stay in Paharganj, Delhi, within walking distance of Ramakrishna Ashram Marg metro station. It is a budget-friendly hotel that is close to the Paharganj Bus Stop. Nearby attractions are Desh Bandhu Gupta Statue, Shree Hanuman Temple, Chawri Bazar, Razia Sultana Tomb, and Jahndewalan Mata Mandir. The hotel uses wood-finish cladding to add warmth to its reception and common areas. The rooms also feature wooden wall panels and have bright bed linen. The bathrooms are tidy and have trendy fixtures. Each room comes with AC, TV, seating area, heater and free Wi-Fi. There is an elevator on the premises and the hotel offers card payment facility. Restaurants like Chawla De Mashoor Special Nan, Bikaner Sweets Corner and Sita Ram Diwan Chand are close to the hotel.